ANY CLIMBER ALREADY KNOWS that warm-ups are essential to a day out on the rock—maybe a few runs at an easy boulder. Or if you are out sport climbing, you probably do a few jumping jacks or traverse on the rock for a few moves to get your body ready for the long day. Adding in a few yoga poses will add some dynamic stretches into other areas, including your hips, torso, and spine in addition to your shoulders and arms. Bring in some twists to fire up your back muscles, and you’ll find it easier to turn your body for a complicated move. Plank will warm up your core, hands, and elbows, and One-Legged Chair and Low Lunge will help to access your high step faster. A yoga practice also offers mindfulness, whether you are climbing outside or headed to the gym. Practice breathing and being present before you climb, and you will more quickly tap into that feeling of calm during the climb ahead. At the end of your day, doing some poses to unwind will help your body recover, particularly if you are out all day on multipitch climbs or you have bouldered for hours. Do a few poses before you leave, while your body is still warm. It doesn’t take much effort and the rewards are worth it. » Stop and stand still for a moment. Look around. Note the place around you, whether it’s a gym or the mountains. Observe the temperature of the space on your skin. What do you smell? What can you see? Do you see people on the rock wall or the contrast of dark mountains against blue sky? Do you hear people shouting “take” or the whistle of wind through the trees? » Breathe deeply for five breaths. » Find a fairly even surface. Do a few yoga poses. » Stand with your feet together. » Reach your arms up to the sky. Feel the great stretch in your spine. » Lift your face to the sky. Breathe deeply for five full rounds. » Stand with your feet wider than your shoulders. » Lower your hips down between your feet so your hips dip below your knees. » Press your elbows into your inner knees. » Lift your chest up to the sky. Stay for ten breaths. » Stand with your feet at hip-width distance. » Bend your legs slightly at the knee. » Fold your chest forward over your legs. » Interlace your fingers at your lower back to bind your hands. » Stretch your arms away from your back. Stay for five breaths. » Stand with your feet a leg’s length distance apart from each other, turning both feet out. » Bend your knees, tracking your knees over your ankles in the direction of your toes. » Bring your hands to your inner thighs, and press until your arms are straight. » Lower your right shoulder toward your left foot for a twist with your core engaged for five breaths. » Come back to neutral. Lower your left shoulder toward your right foot for five breaths. » Stand with your feet together. Lower your hips toward the ground for Chair pose. » Cross your right ankle over your left knee. Flex your upper foot. » Insert your thumbs into your hip crease (the indentation where the top of your leg meets your hip socket), and press your hips back until you feel a stretch in your hip in your bent leg. » Hold for five breaths. Repeat on the left side. » Alternative: Hold onto a tree or use a boulder or a wall for balance. » Stand with your feet together. Step your left foot back and lower your left knee to the ground. » Pull your left hip toward your right knee. Pull in your belly toward your spine. » Lift your arms up parallel to your ears. » Stay for five breaths. » Bring your hands back to the ground. Step your back foot up to your right foot. » Do the pose on the other side. » Bring your hands to the ground. Step back to Plank Stack your hands under your shoulders. Squeeze your legs straight. » Keep your hips just below level with your shoulders. Pull your arm bones into your shoulder sockets, squeezing them toward each other, and stretch your chest long. » Stay for twenty rounds of breath. 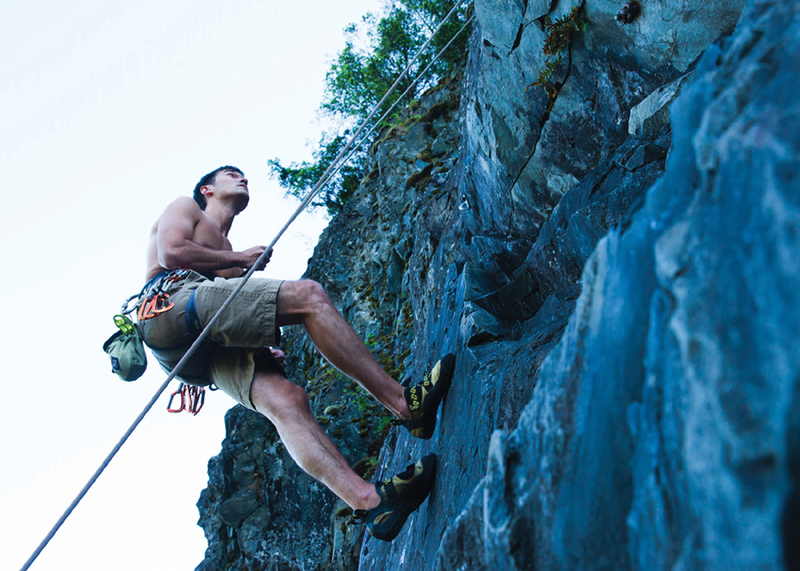 Climbing is intense, and these poses will help your body ease out of your time on the wall. Add the following poses after you complete the Pre-Climb Practice (above) sequence to help release your hips and lower back. Take off your climbing shoes and stretch out your toes! Do all the poses in order on your right side, then switch to your left. » From Mountain pose, step your left foot behind you to a Low Lunge with your right foot in front, and your back knee on the ground behind you. » Lower your left hand to the ground; squeeze your inner thighs in toward your pelvis. » Stretch your right fingers up to the sky. Hug your shoulder blades toward your spine. » Engage your core lock. Look up past your right hand to the clouds. Stay for five breaths. » From your Low Lunge, tuck your back toes and spin your back heel toe the ground. Stack your front knee over your ankle, and lift your chest over your hips for Warrior 2. » Keeping your front foot facing forward, straighten your front leg. » Reach your front hand forward until your right ribs are parallel to the ground. » Lower your right hand to your right shin. Stretch your left fingers to the sky and look up past your left hand. » Come up to stand from Triangle. » Spin your right foot parallel with your left foot. » Turn your left toes out slightly at an angle, and bend your left knee over your left ankle. » Keep your right leg straight. Bring your hands to the ground under your shoulders. » Lift your chest even with your hips. Stick your sit bones out behind you. » Pull your belly in toward your back. » Shift your weight forward into a Low Lunge. Bring your hands to the ground inside your right foot. » Turn your right toes out at an angle, and roll to the outer edge of your foot. Keep your foot flexed. » Stay here with hands on the ground or deepen by bringing your forearms to the ground. » Come up to your hands from Lizard. » Walk your right foot in front of your body until your right knee comes to the ground. Keep your foot flexed. » Square your hips toward the ground. Lift your chest up and lengthen your spine. » Slowly lower your chest to the ground. » If you have knee pain, modify with a Reclined Half Pigeon on your back from Strength Practice I. » Stay for ten breaths. » Sequence Transition: Complete Twisted Crescent Lunge through Half Pigeon on the right side, then do the poses on your left side. Move to a seat for Toes Pose. » If you haven’t yet, take your shoes off for this closing pose. » Come to your knees on the ground. » Tuck your toes underneath you until you are on the balls of your feet—tuck your pinky toes in if they escape. » Slowly sit back on your feet to stretch the soles of your feet and your Achilles tendon. » Counter pose: Shift forward onto your hands and knees. Release your toe tuck and point your toes on the floor. Bring your hands to the ground behind you and lean back on your feet to stretch into your shins, the front of your foot and your ankles in the opposite direction to counter the intensity. » Modify a floor shoulder-opening pose by doing this against a rock wall. » Face the wall, standing up straight with your chest touching the wall. » Extend your right arm out 90 degrees so your fingers are just above shoulder height. » Slowly spin your body to the right until you feel an opening in your right shoulder. Keep your body flush to the wall.